So last week a friend of mine and I took our kids to the Discovery Gateway Children's Museum in Salt Lake. We enjoyed the museum for a little while, ate lunch outside and then let the kids run around in the fountains. Before going back to the museum, an adorable toy store begged us to come inside and play. So we did. For a long time. Longer than we had been at the museum; longer than it had taken us to eat lunch; longer than the bathroom and drink break in the Grand Hall of the Union Pacific Depot; longer than we spent at the museum after we had finally finished playing with sock monkeys and bubber. The store's name? Blickenstaff's. No, I did not just sneeze, and you'll probably need to practice a few times before you get it right. BLICK, as in...well I have no idea but it rhymes with BRICK. The next part's easy--EN--and finally, STAFF'S, as in a shepherd's crook, candy canes or the nasty infection, whichever helps you remember best. Blick-en-staff's. 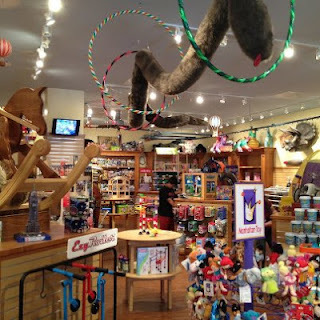 This store was seriously awesome. The kids kept entertained the whole time we were there and the store has lots of fun toys, games, novelties, candy, fun, fun and more fun. We got a Chinese jump rope which my kids and I are very excited about. If you're ever at the Gateway in Salt Lake check them out. Their website is pretty cool too where you can shop for candy by the decade. I love Chinese jump rope. I still have mine, I think....looks like a fun place, must check it out. I bought my daughter a chinese jump rope online a couple of years back but she loaned it to a girl at school who promptly lost it. Glad to know there is somewhere to replace it.